Catalans form a human chain and call for independence from Spain. 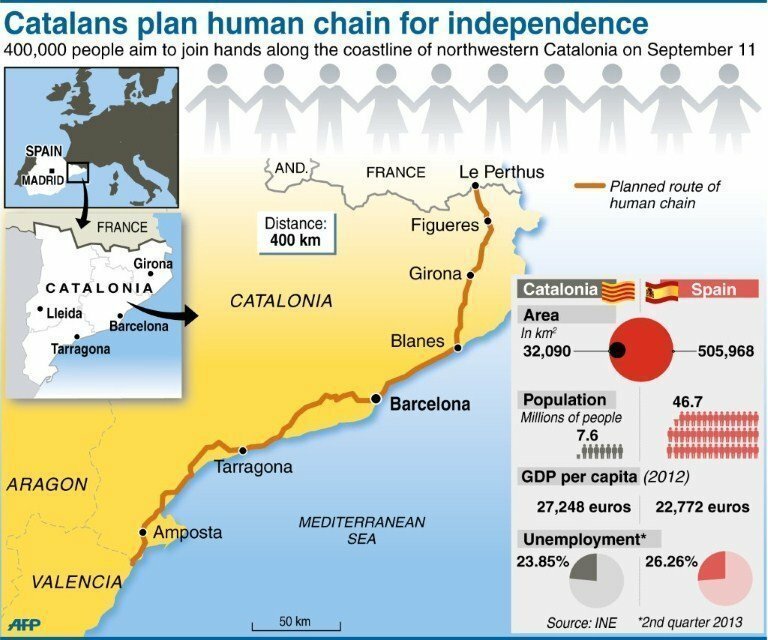 At least 400,000 Catalonians (1 million by an Associated Press report) joined hands on Sept. 11 to form a human chain 250 miles long, running from the border with neighboring France to the region of Valencia in a call for Madrid to recognize Catalan independence. Wednesday was la Diada, or Catalan National Day, when the region commemorates the defeat of its troops in the Spanish war of succession in 1714. And at 5.14pm the human chain – or Via Catalana – linked arms. Independence has been a long-running battle between Catalonia and Madrid, but as the recession continues to hit the country harder, demands for a referendum on secession have grown, and the National Assembly of Catalonia called on its supporters to take to the streets to show their strength. Polls suggest as many as 50% of Catalans want independence, and up to 81% support the right to hold a referendum (a vote by the people) [about whether they want independence from Spain]. The view from Madrid [and] prime minister Mariano Rajoy is that any independence referendum would be illegal. Catalan president Artur Mas has said he would use elections scheduled for 2016 as an effective referendum on independence The National Assembly of Catalonia argues they should not have to wait that long, calling for a referendum in 2014. Scientists using technology developed to search for oil have discovered a vast underground water reservoir in one of Kenya’s driest regions that if properly managed could supply the country’s needs for close to 70 years. Researchers from a French-American firm, Radar Technologies International, worked with theKenyan government and Unesco, to layer satellite, radar and geological maps on top of each other, and then used seismic techniques developed to find oil to identify the reservoir. It lies in Kenya’s extreme northwest, close to its borders with South Sudan, Ethiopia and Uganda. The area is sparsely populated and prone to conflict over existing scarce resources. “It is important to say that these are early estimates, and these resources must be managed well in order that they benefit the people of Kenya,” said Mohamed Djelid, Unesco’s East Africa director. “But if all goes well, we can say that this really is a game changer.” Close to half of Kenya’s 41 million people have no access to clean water, and farmers in arid areas struggle to raise crops without adequate irrigation. 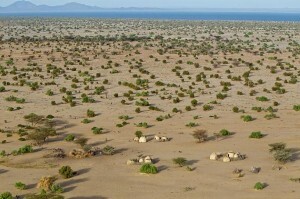 Tapping the new reserves, in the Lotikipi Basin in the Turkana region and other areas nearby, could create vast new zones of farmland in landscapes where today even the hardiest plants struggle to survive. “The news about these water reserves comes at a time when reliable water supplies are highly needed,” said Judi Wakhungu, cabinet secretary at the Kenyan environment, water and natural resources ministry. “This newly found wealth of water opens a door to a more prosperous future for the people of Turkana and the nation as a whole. …There have been similar announcements of massive new water finds beneath Africa’s driest areas in the past. In 2007, scientists said that they had identified an underground “megalake” in Sudan’s war-torn Darfur region that was ten times the size of the Kenyan discovery, but its bounty has yet to be tapped. “From what I’ve seen of the figures on the Turkana find, it looks very encouraging,” said Brian McSorley, a water expert at Oxfam in Nairobi. “But knowing there’s water there, and then getting it to the surface, are two different things. There will need to be decent follow-up studies and then proper investment to ensure it benefits the poorest people there.” The aquifers lie as deep as 1,000 feet, which poses significant technological and cost challenges compared to shallower reserves, Mr. McSorley said. Kenya’s government will now carry out further drilling in areas surrounding the sites where the new water supplies were first drawn to the surface, to gather more data on their true extent. The land that lies above is among the most hostile in Kenya. There are few roads or electricity supplies, and the Turkana, Samburu and Pokot tribes that live there are regularly at war with each other. The border area between Kenya, South Sudan and Ethiopia, known as the Ilemi Triangle, has never been officially delineated (had the boundaries clearly marked). Constructing, fueling and maintaining boreholes, and building pipelines to bring the water supplies to remote communities, will also pose significant difficulties. 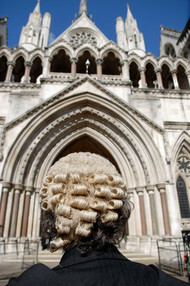 A barrister (lawyer) wearing a legal wig arrives for a case at the Royal Courts of Justice in London. Cameras are set to be allowed to broadcast from inside court rooms for the first time, after Britain’s House of Commons granted approval. From next month filming will be allowed at criminal and civil hearings in the Court of Appeal during legal argument and judgments. The British government is also planning to extend filming to allow the broadcasting of sentencing remarks in Crown Court cases. However, unlike in the United States and some other countries in the world, there are no plans to show witnesses or defendants in court. The proposal will now go before the House of Lords, but limited filming is expected to begin next month. Proceedings in the country’s highest court, The Supreme Court, are already streamed live on the internet. Filming inside courts has been banned since the Criminal Justice Act of 1925 when broadcasting was in its infancy. The cost of filming in court will be covered by the media organizations. In July a High Court murder trial in Scotland was filmed and broadcast as part of a documentary. The film-makers got permission from all the key participants in the trial, including the defendant, Nat Fraser, who was convicted of murdering his wife in 1998.
b) Read the “Background” and watch the video under “Resources” – what do you think is the reason for the increased number of Catalans who want independence? c) What percent of Catalans want a referendum on independence from Spain? Do you think the president of Spain should allow Catalonian independence to be brought to a vote? Explain your answer. b) Do you agree with the idea of permitting news cameras in courtrooms? Does it make a difference if the plaintiff and defendant are not on camera? Explain your answers. c) Should the U.S. Supreme Court allow cameras in court the way the British Supreme Court does? Why or why not? This feeling is fed by memories of Francisco Franco’s fascist dictatorship from 1939-1975, which attempted to suppress Catalan identity: the Catalan language was banned in schools, publishing and from public use. A roughly triangular region in Spain’s far north-east corner, Catalonia is separated by the Pyrenean mountains from southern France, with which it has close historical ties. Most of the region’s population lives in Barcelona, its vibrant political and economic hub and a popular European travel destination. Catalonia’s regional leader Artur Mas has promised to hold a referendum on independence in 2014, but the Madrid-based government has said that such a vote would be unconstitutional. Polls indicate that the majority of Catalans agree on holding a referendum, though surveys indicate support among residents for independence is around 50 percent. It falls to less than that when those questioned are asked whether they would want a separate Catalan state outside the European Union. It is an underground layer of water-bearing material, such as gravel, sand and silt. Water can be extracted from the materials by using a well. The newly discovered Lotikipi Basin Aquifer could provide water to Kenya for 70 years. But just as importantly the aquifer is replenished from distant mountains. So it should never run dry, assuming it is managed properly. And just like a giant sponge, this ground water is held in the spaces between the rocks and in the tiny inter-connected spaces between individual grains in a rock like sandstone. These bodies of wet rock are referred to as aquifers. Ground water does not sit still in the aquifer but is pushed and pulled by gravity and the weight of water above it. The aquifer is approximately 100 km (62 miles) by 66 km (41 miles). It has a surface area of 4,164 km2. It contains an estimated 200 billion cubic metres of fresh water. Lotikipi alone holds 900% more than Kenya’s current water reserves.